This is the softest, smoothest ground flaxseed you will ever have. It is the absolute best. Manitoba Milling Co.'s unique milling process allows them to select only the highest quality seeds. Because of the high quality, their product does not require refrigeration like most brands. When flaxseed is consumed in the ground form you will benefit from the omega-3, antioxidant, and protein content as well as fiber. 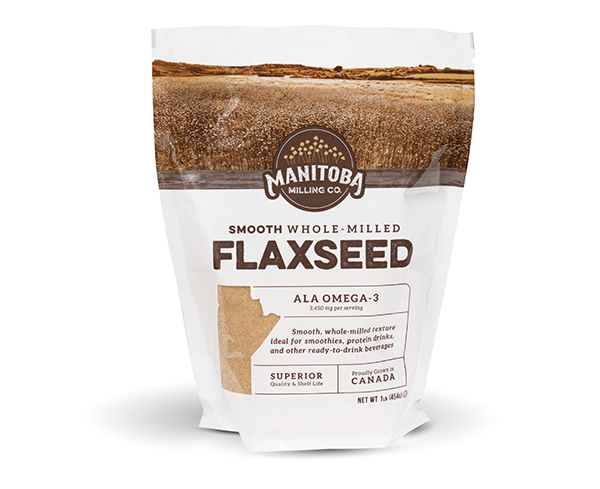 Manitoba Milling Co.'s flaxseed contains a day's worth of Omega-3s! Try their pancake and muffin mixes and their new flax milk too! Use code 25MANITOBA at checkout for 25% off your first order of flaxseed or 25FLAXMILK for 25% off of the new Flax Milk! Collagen peptides is a newer product and it is said to help with gut repair, skin hydration, and bone and joint health. Collagen peptides can be added to smoothies, soups, oatmeal, yogurt, drinks, and more. I like using Further Food’s Collagen Peptides as a tasteless protein powder to add to oatmeal and smoothies. It has not additives or artificial sweeteners like other protein powders. I prefer Further Food over other brands because of its smooth texture (I’ve found other brands of collagen to be weirdly chunky). Further Food also just released a Gelatin which is super fun to make fruit gummies or jello with no added sugar. Use the link below and a 5% discount will automatically be applied to your cart at checkout.